"Tightrope Routines" is a storytelling performance based on a year of exchanges between feminist artist Angela Washko and a pick-up artist, author, blogger and notorious manosphere leader deemed “the web’s most infamous misogynist”. The performance began with a provocation called BANGED* and outlines the story of an artist’s experience shifting from activism to ethnography in a space of extreme hostility toward women and particularly feminists. 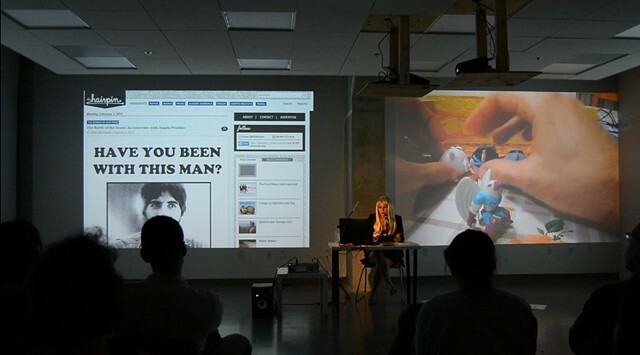 The piece has been performed at Los Angeles Museum of Contemporary Art, Experimental Media Lab at University of California - San Diego, Dixon Place in New York City, Temple University's Paley Library Auditorium (in conjunction with the Beyond the Page Artist Residency Program), The Special Effects Festival in New York City, San Diego Art Institute and Youngstown State University. *BANGED was a project initially proposed as a platform in which Washko would interview women who have had sexual encounters with the pick-up artist (a former industrial microbiologist who now writes textbooks called about “picking up girls and getting laid” across geographic and cultural boundaries) and produce a parallel book and web-based project to his conquest narratives. The project became problematized when the manosphere blogger became aware of it online and Washko decided she would have to proceed in conversation with the subject of the work himself, beginning by conducting a two hour long interview with him.